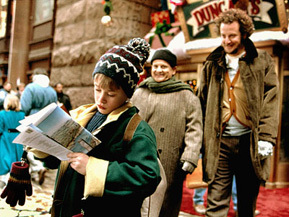 It truly is the most wonderful time of the year, and in keeping with the season, this festive installment of Things I Learned From Movie X (or "A Things I Learned From Movie Xmas", if you want to be extra Christmassy) will focus on one of the most successful Christmas movies ever made, 1992's Home Alone 2: Lost In New York, in which the world's most violent ten-year-old is unleashed on the streets of Manhattan, like a three-foot Godzilla, leaving chaos and destruction in his wake. What deeper subtext is there to be drawn from a film which features Daniel Stern getting a stapler shot into his crotch? You'd be surprised, maybe.